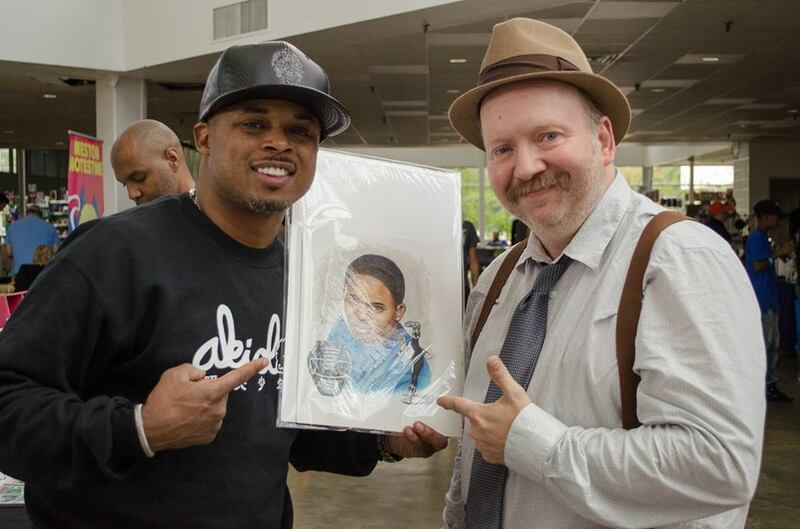 This past month I was set up in Artist Alley at the Memphis Comic Expo, or “DonnieCon” as I call it. It was back at the Agricenter International near Shelby Farms/Cordova instead of downtown at the Convention Center. I dig this location much better! It’s a very creator and comics friendly show, and the best “comic con” (and on of the most reasonably priced) in the Memphis area in my opinion. 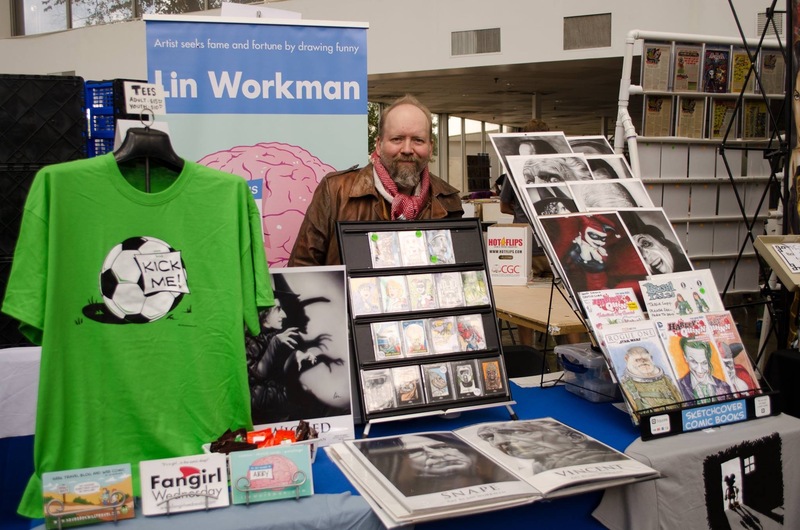 Show organizer Donnie Juengling is the manager of Comics and Collectibles and like to say “creators come first“. 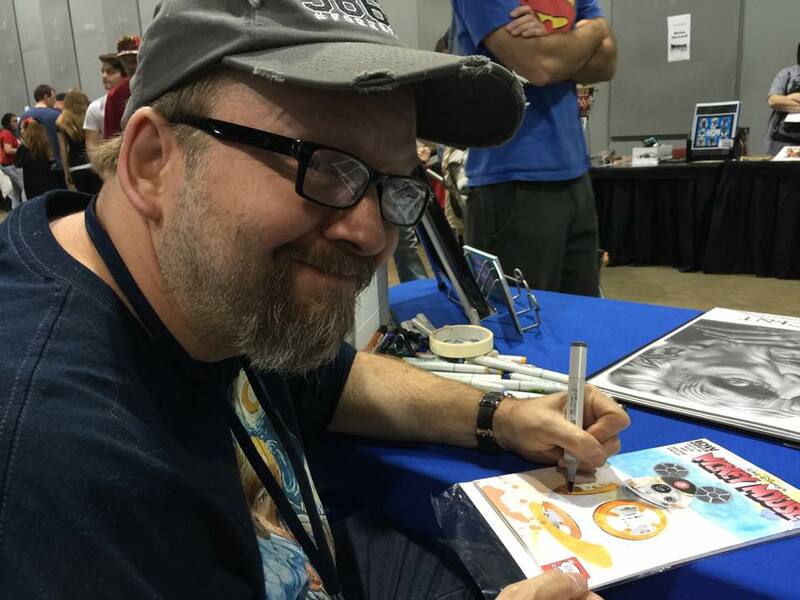 Donnie has been a good customer of mine, and has bought several sketchcovers from me. He’s also been very supportive of my work over the years. 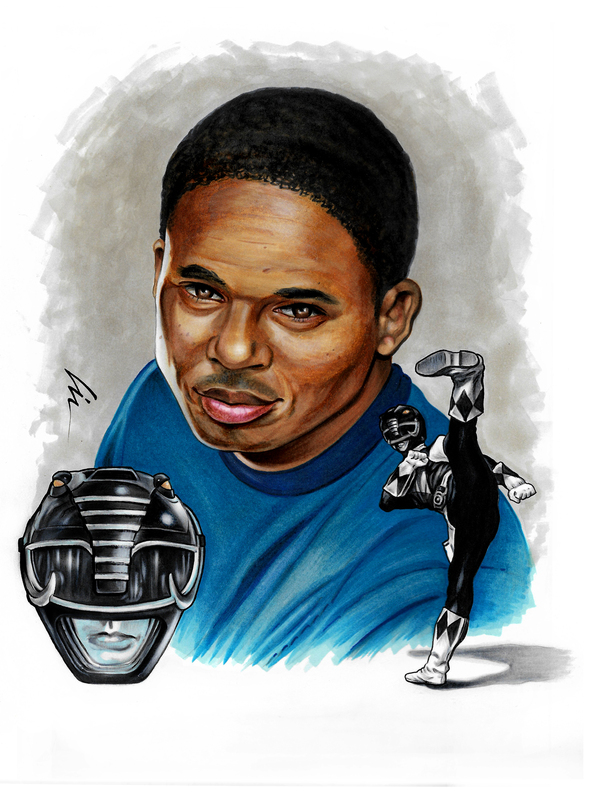 Donnie commissioned this marker illustration of Walter Jones/Black Power Ranger from me before his show. 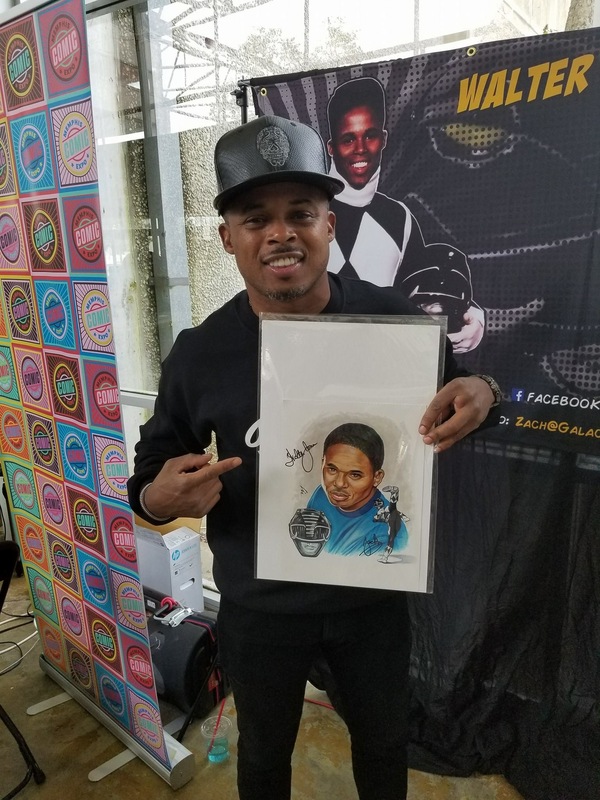 I got to talk to Walter a bit- he loved the drawing and signed it for Donnie. He complimented me for including his freckles and forehead scar. Speaking of commissions, I normally don’t do them- especially at shows. I don’t like the cramped space, the bad lighting, people bumping the table, limited time, and LOTS of other reasons. People sometimes just seem to be afraid to walk up if you’re drawing, or you get so distracted and caught up in the drawing you don’t realize someone is there before they walk off. 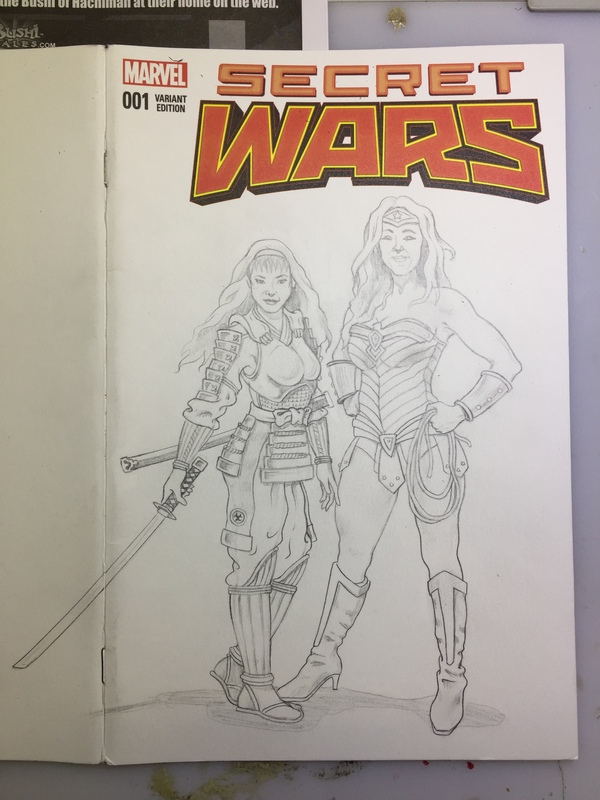 If I do draw, it’s a quick freebie for a kid, an autograph doodle, or something to keep me busy- but not so busy I can’t keep an eye on the table. 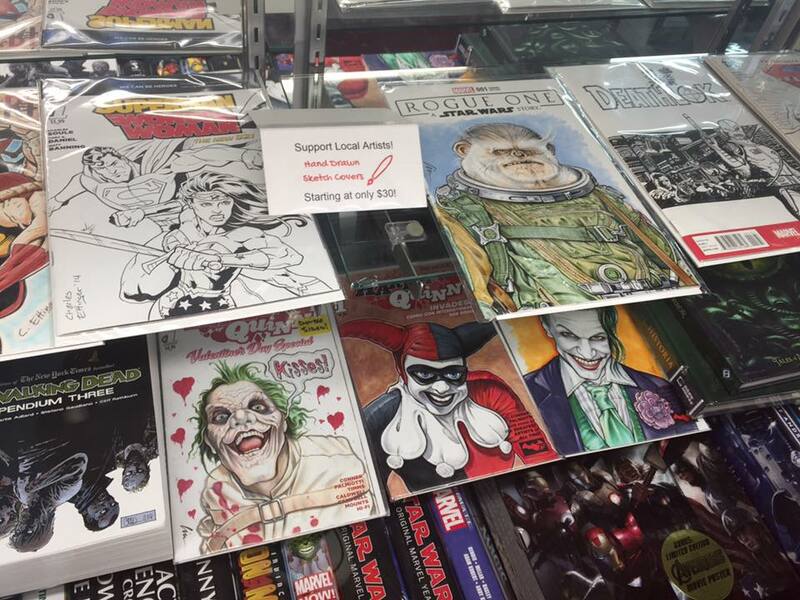 I prefer to draw stuff at home in my Batcave studio and bring that to the show to sell or offer them at Comic Cellar. I like to draw things I’m into, and hope that someone out there would like to own it. So far that’s worked out and keeps drawing fun for me. 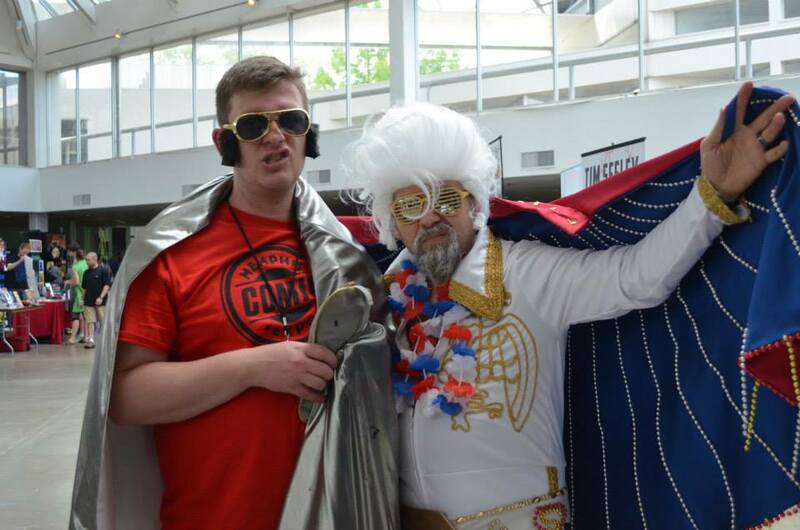 But this year at DonnieCon I got an interesting request. 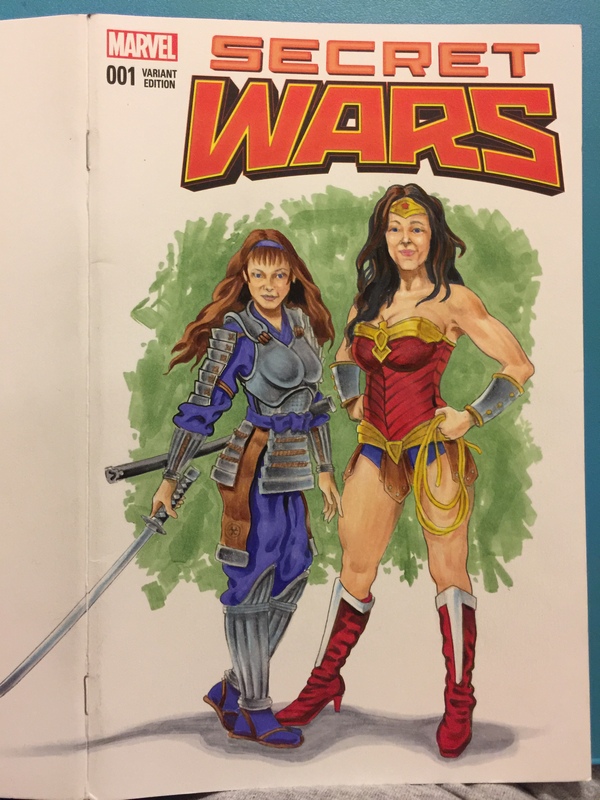 Michael, a guy I had met at ConKasterborous in Huntsville, AL wanted a sketchcover of my Bushi Tales charater Mikah– and Wonder Woman. I couldn’t say no to that! 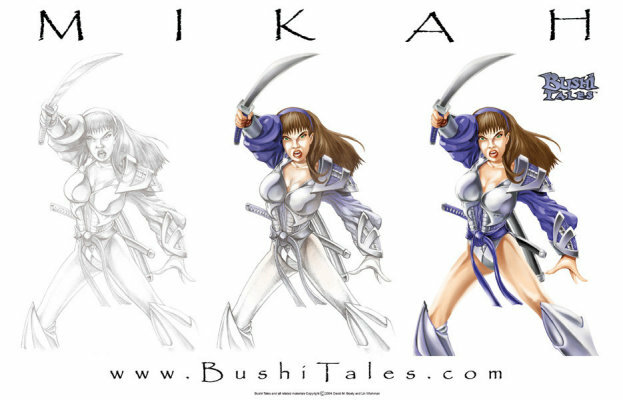 Back in the day, my partner and Bushi Tales co-creator Dave Beaty would have been the one to draw Mikah and the other BT characters, and I’d just color them or paint on top of Dave’s pencils and/or inks. 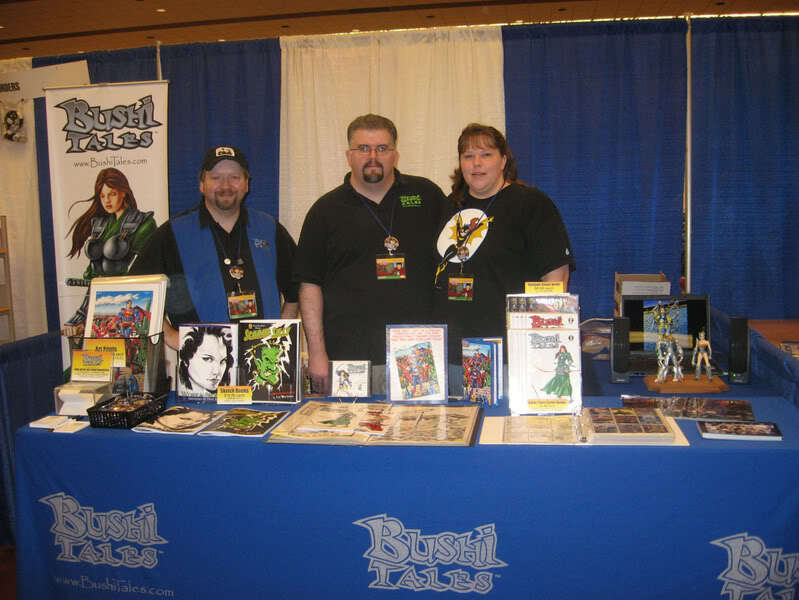 Bushi Tales started off as a webcomic, but we did self-published 3 issues of the comic and have it distributed through Diamond before deciding to shelve the project. 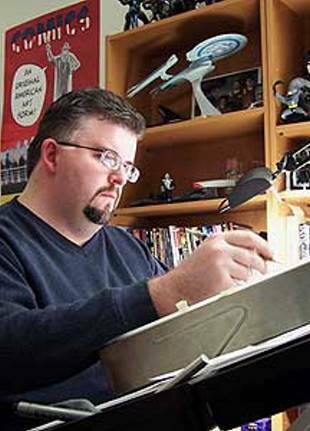 Dave has since worked for Marvel, DC Comics, and other comic publishers and trading card companies. 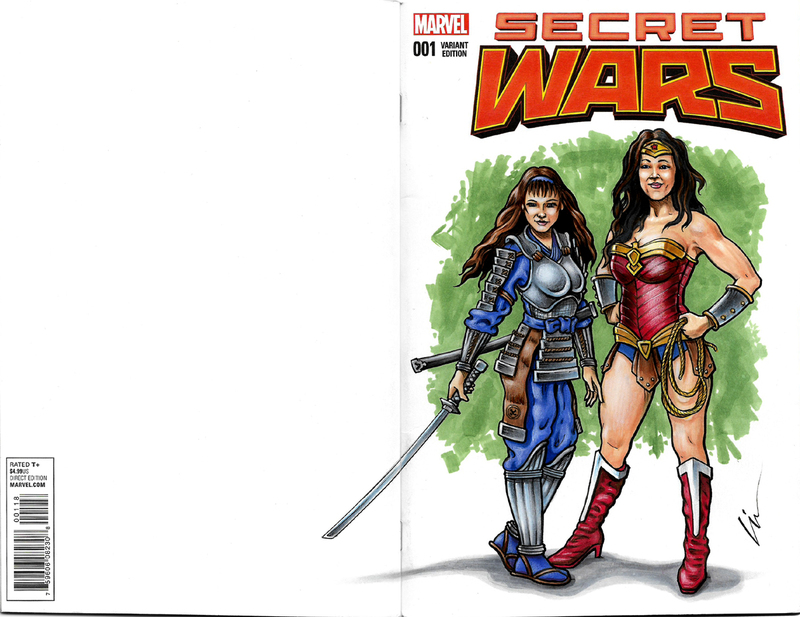 Michael provided me with the blank Secret Wars cover, and since they are both warriors I thought it was a good choice. He requested that it be just on the front, but I thought it was kind of fun to have the sword wrap around to the back. I started off penciling in the figures and working out the shading with just a regular yellow No.2 pencil. I then broke out my Copic markers and started to flesh them out. Like the Ninja Turtles, each of our BT girls wore a different color and had a different weapon. Mikah’s color was purple- which also happened to be Dave’s wife Micah’s favorite color. She helped with color flats on the comic and loved to sign the comics with a purple sharpie. We all hit a lot of cons together! I really liked it when we would take an extra day or so just to be tourists in cities before, after, or during a convention. Loved going to Phoenix, Seattle, Philly, Red Bank, Reading, and San Diego. I found about four different cosplayer photos online for use as reference for the poses and faces. 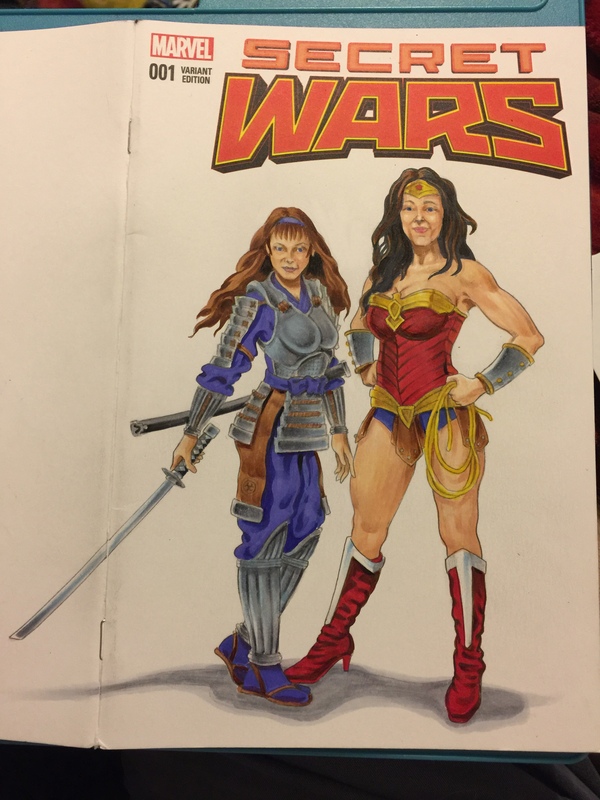 Michael had texted me a photo of the type of Wonder Woman costume he was interested in. I tweaked a few things on the Amazon’s costume, and made it a bit of a cross between the bathing suit and battle skirt versions. I was debating on whether I wanted to go with the BT CD soundtrack art version of Mikah’s “battle armor” (above), or go classic/traditional like the comic- I decided to keep it classic. Always wanted to see someone cosplay as one of our characters, but never did. 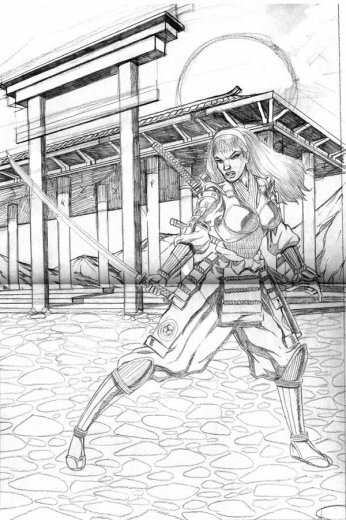 Once the figures were fleshed out I added in the background, and then started to ink the girls with Micron pens. I’ve never been super-confident with my inks, and never really feel comfortable inking things. But it has gotten less stressful for me over the years- unless I have to ink in public..! 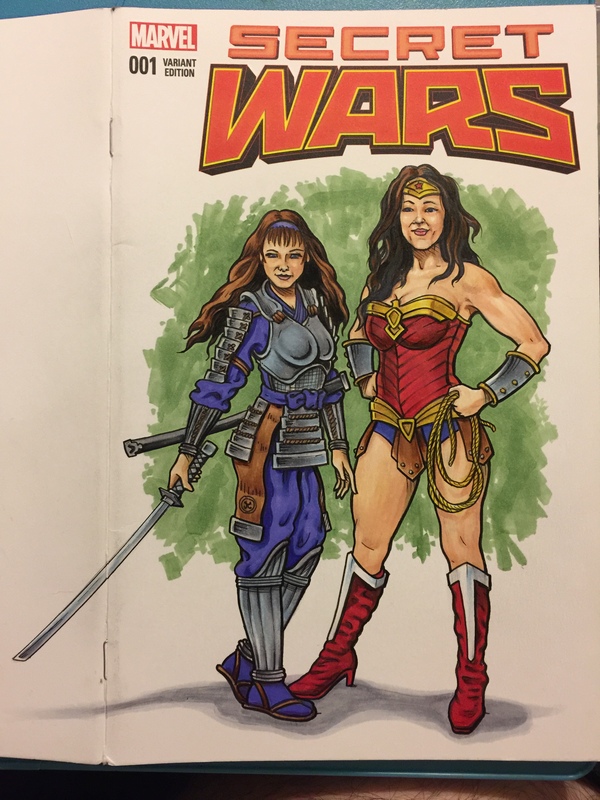 It’s funny- airbrushing in public has never bothered me, but drawing in pubic makes me uncomfortable, and inking or drawing with a Sharpie marker makes me nervous as all get out! Once the inking torture- uh, I mean “process” was done, I did some highlights with a white Prismacolor pencil and a Gelly Roll pen. After all the work was done it was time to protect it with some spray fixative and really stink up the place. Once good and dry I bagged, boarded, and then shipped the comic out to Michael. A few days later he let me know he got it and really dug it. 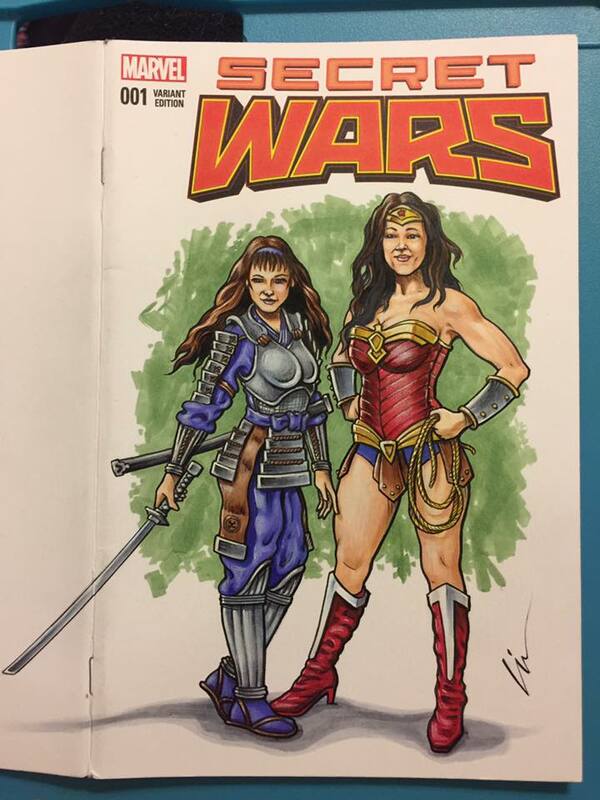 Always great to have someone happy with a commission. 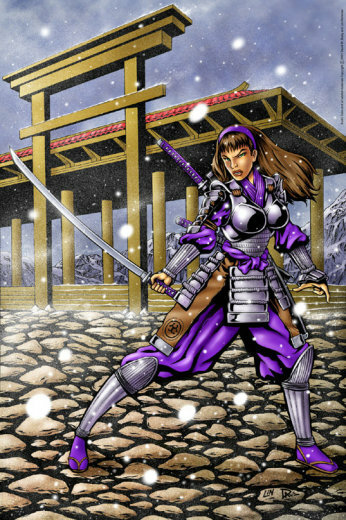 I definitely DO NOT envy Dave for having to draw all that armor and hair in the Bushi Tales comics! I wish more BT comics had been able to come out, but unfortunately it just wasn’t meant to be. Maybe someday Dave, Micah, and I can revisit these characters again, but for now this sketchcover was a nice visit to my past. 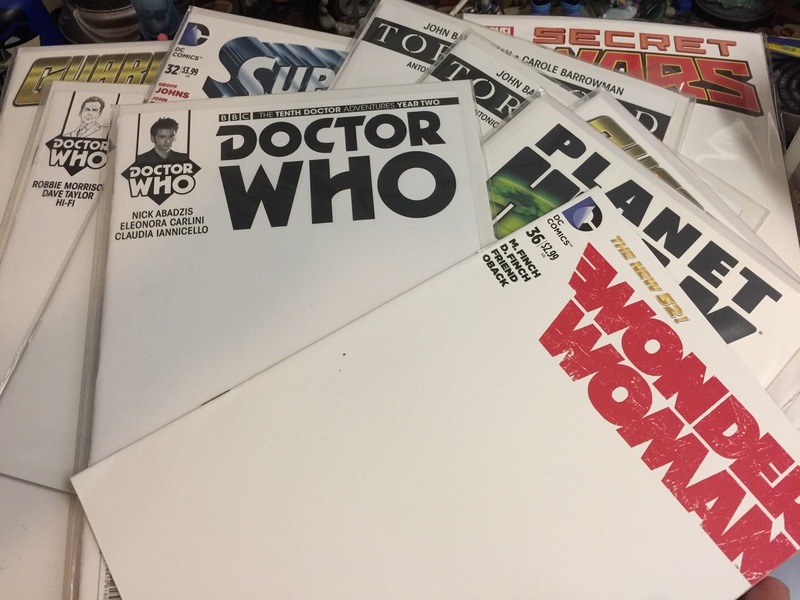 Oh, I picked up several sketchcover blanks at DonnieCon on Sunday, and will be sharing more as I finish them. Many will be fore sale at upcoming shows or at Comic Cellar in Memphis. I’ll also have some of my sketchcards for sale there soon, too.